High potency vitamin D3 providing 1000iu vitamin D per capsule for optimum support. 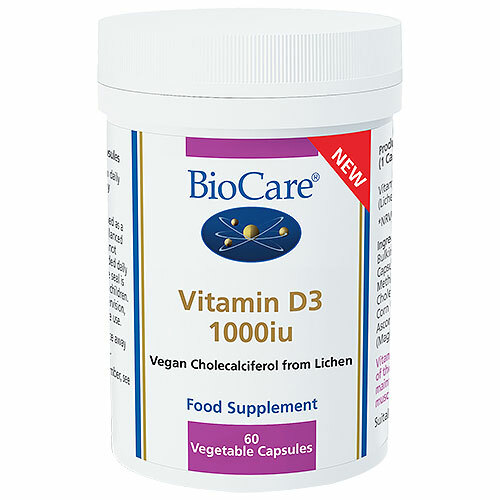 BioCare vitamin D capsules are sourced from lichen and are free from allergens. Vitamin D helps to contribute to the normal function of the immune system and to the maintenance of normal bones, teeth and muscle function. Bulking Agent (Microcrystalline Cellulose), Capsule Shell (Hydroxypropyl Methylcellulose), Vitamin D3 (Preparation as Cholecalciferol (Lichen) with Maltodextrin, Corn Starch, Sucrose, Silicon Dioxide & Ascorbyl Palmitate), Anti-Caking Agent (Magnesium Stearate). 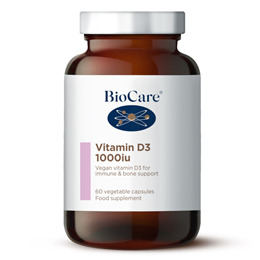 Below are reviews of BioCare Vitamin D3 - 60 x 1000iu Capsules by bodykind customers. If you have tried this product we'd love to hear what you think so please leave a review.